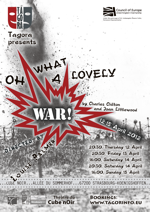 Preparations are well under way for Oh, What a Lovely War!, our spring production scheduled for 12 to 15 April. With an on-stage cast approaching fifty people, the rehearsal space is a bit cramped, but we are soldiering on – an appropriate term in the context. There’s more about the play here; and further details will be added very shortly. This production is now over. You can see photos here.